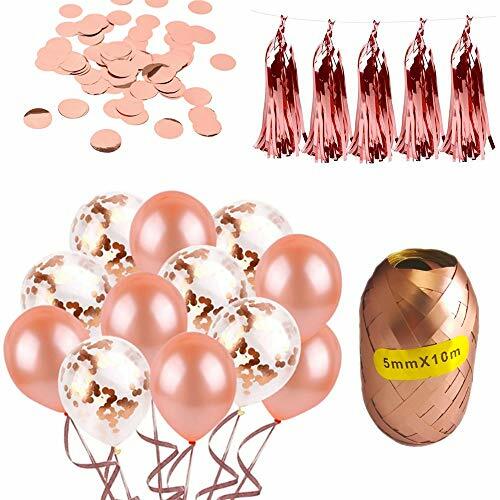 Rose Gold Party Decorations and Supplies for Wedding Showers, Bridal Showers, Engagement Shower Parties. The Decor Includes 40 Balloons, Confetti, Ribbons, Tassels. This set includes: (40) 12 inch Balloons. 30 Rose Gold and 10 Transparent balloons with Rose Gold confetti Inside them, 5 Piece Tassel banner, Ribbons, and Confetti for your table! Please use high quality helium for these balloons. BIG BUNDLE-This set includes: 40 Balloons. 30 Rose Gold and 10 Transparent balloons with Rose Gold confetti Inside them. 5 Pc Tassel banner, Ribbon, and Confetti! GREAT QUALITY-These Rose Gold party decorations will be able to withstand any party you throw! BEAUTIFUL ROSE GOLD DESIGN-With these elegant, classy and sophisticated colors, step up your party! PERFECT FOR ALL OCCASIONS - Use this set at a birthday party, wedding shower, or baby shower! GUARANTEE -If you are not satisfied with your purchase, we offer a 100% MONEY BACK guarantee! If you have any questions about this product by Swiss Design, contact us by completing and submitting the form below. If you are looking for a specif part number, please include it with your message.